Made in Jerome Pottery is handcrafted from native clay by David Hall and Jane Moore in their studio/retail shop located in the colorful mountainside community, Jerome, Arizona. 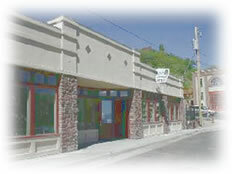 Made in Jerome has been a mainstay on Main Street in Jerome since 1972 and in October of 2000 moved into their new studio at 103 Main Street. Made In Jerome Pottery produces uniquely beautiful stoneware pottery that is both functional and decorative. Specialties include vases, plates, bowls, pitchers and cups. ·Oven proof. Mircrowave and dishwasher safe.